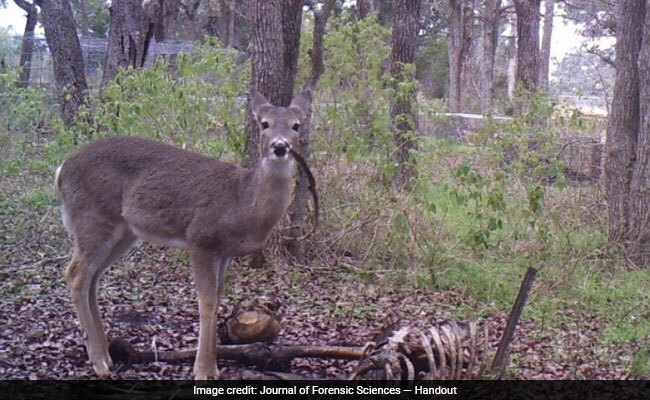 Deer Photographed Nibbling On Human Bones, A First. Forensic scientists knew these herbivores sometimes snack on dead animals. But they'd never before recorded a deer gnawing on human remains. A young Texas deer gnaws on a human rib bone in January 2015. Although they are herbivores, deer have been spotted eating meat and gnawing on bones before. But not this kind of bones. Peer closely at the accompanying photos, and you might discern that dem bones are people bones. More precisely, they are rib bones. We'll get right out of the way that no horrified relatives are just now learning that their missing loved one's fate was to be deer dinner. The body from which these bones came was placed with the highest scientific goals in mind on the floor of that forest, which is better known as the Forensic Anthropology Research Facility in San Marcos, Texas. The 26-acre facility is one of several "body farms" around the nation where researchers plunk donated bodies out in the elements to study the process of human decay and decomposition. 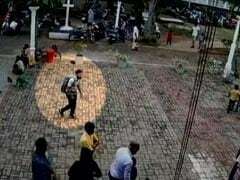 Usually the bodies are placed inside a cage to prevent the interference of scavengers. But sometimes they're left unprotected to see just who might come along to snack on the carcass. Images from remote cameras have revealed that regular diners include rodents, coyotes, raccoons and foxes. This particular body, which researchers deposited in July 2014, was initially stripped by vultures. Then, the following January, a remote camera snapped shots of a new visitor to the scene: a young white-tailed deer. It looked very dainty but for the human rib bone "extending from the side of the mouth like a cigar," in the words of the researchers, who wrote about these first-ever images in the Journal of Forensic Sciences. 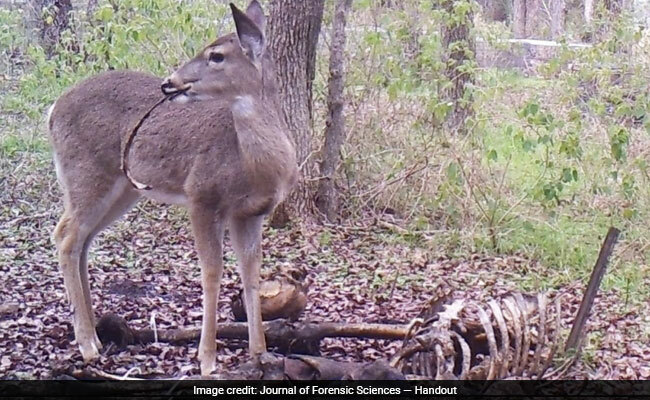 Eight days later at the same location, a deer - maybe the same one - was spotted casually gnawing on another rib bone, looking like one of those rare people who make it through a giant turkey leg at a Renaissance festival. Other ungulates, or hooved mammals, have also been known to nibble on animal remains despite their vegetarian reputation. 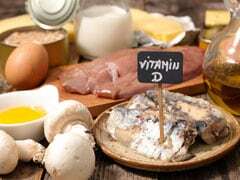 This often occurs in the cold season, when bone is a good source of essential minerals, such as calcium and sodium, that deer and their cousins cannot procure from their local forests' barren midwinter produce section. In an email, lead author Lauren Meckel, a graduate student at Texas State University, emphasized that the deer caught on camera was not flesh-eating. It was bone-eating, and more specifically, it was dry-bone eating. Carnivores typically go for fresh remains and puncture the bones, whereas ungulates prefer desiccated bones and leave behind a "stripped, forked pattern" with their zigzagging jaws, the paper notes. This might actually be useful, and not just grisly, information. While ungulates are not big players in what the authors refer to as "the scavenging guild," Meckel said the Texas discovery could help investigators who are analyzing human remains determine the cause of bone damage - and whether it happened at the time of death or later, perhaps when Bambi needed a calcium boost.